As with choosing refined or natural foods, choosing a natural sugar or sugar substitute will be better for baby’s health (and the whole family’s health) than choosing a highly refined sugar. 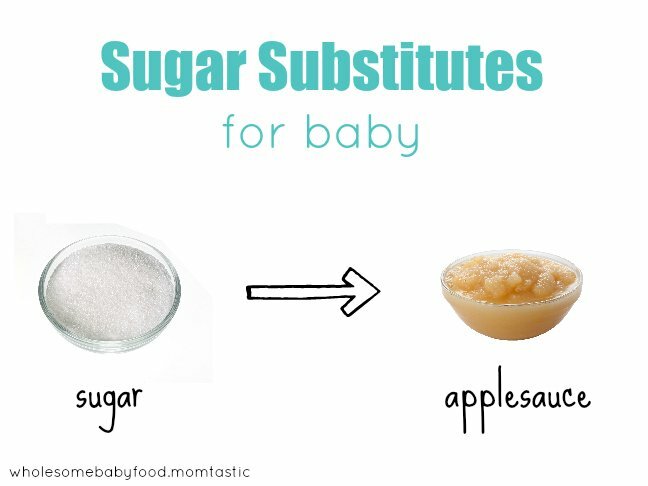 Please remember that your baby’s “everyday” foods do not need sugar or other sweeteners. There is no need to add sugar to applesauce for example. The sugar substitute items mentioned below will all contain some sort of sugar such as glucose or fructose and will have carbs and calories as well. It is important to note that in a baked good recipe that calls for 1/2 cup of sugar, your baby will not be consuming 1/2 cup of sugar with every bite of homemade teething biscuit that you offer. While substitutes such as splenda or nutrasweet are available, it is far more healthy to use a natural sugar rather than a chemical one. Using a minimally processed and minimally refined sugar is also better than using a white sugar. Please keep in mind that whenever you are using a substitute, you may need to adjust other ingredients in the recipe. For example, if you use a syrup instead of a granulated sugar, you may need to increase the amount of flour or other dry ingredient called for. Brown rice syrup is made by combining barley malt and brown rice and cooking the mixture until all the starch is converted to sugar. The mash is then strained and cooked down to a syrup that is only 20 percent as sweet as sugar. The final product is roughly 50% soluble complex carbohydrates, 45% maltose, and 3% glucose. It is a “time-release” energy source. The glucose is absorbed into the bloodstream immediately, the maltose digests over one and a half hours, and the complex carbohydrates burn over two to three hours. Brown rice syrup is considered to be one of the healthiest sweeteners in the natural foodindustry, since it is produced from a whole food source and is made up of the simple sugars. Agave is tapped, like maple syrup, from the agave cactus and is honey like. I have not seen it in powdered or granulated form. It’s sweetness is much like maple syrup crossed with molasses. I am personally not keen on agave and much prefer honey or maple syrup as they are completely natural and straight from the source, no refining or extracting needed. Maple syrup is the liquid form of the boiled down sap from the maple tree. You may also find Maple Sugar which is the granulated form or maple syrup. Honey is a great substitute for sugar but please, not until after baby is 12 months or older! Not just a substitute for cooking oil, applesauce may be used as a sweetener and even bananas can sweeten a baked good recipe too.